Can use minced chicken or any other vegetable instead minced mutton. Can add green chilies as per your taste. You can freeze the samosas or keep in the fridge if you are using them later. 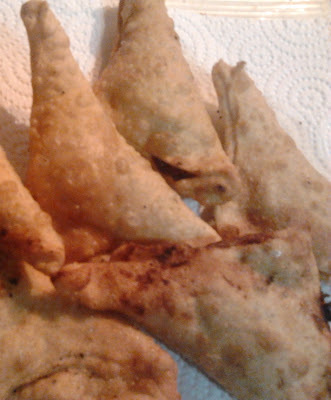 Instead of making the cones using dough one can also use readymade samosa strips / samosa patti. Dampen slightly and place a portion of stuffing and fold into a triangle shape. Can add corn flour to make the gravy thick and to prevent it from having any water content. If the gravy is already thick without adding corn flour then avoid step 9. Sieve all purpose flour with salt. Add oil and sufficient water and knead for 5-7 mints into a stiff yet smooth dough. Keep covered with a wet cloth / closed container for half an hour. Meanwhile, heat oil in a cooker. Add onions and salt, saute until they turn to brown. Add tomato, garlic,ginger, green chilies and fry for few seconds. Now it's time to add cleaned mutton keema and little water. Fry for some time. Close cooker lid and wait for 2 whistles. On cooling, open the lid and check if gravy is thick. If the gravy is not thick and has water content then add corn flour and bring it to a boil. When it cools, start to make samosa cones. To make samosa cones, divide dough into sixteen equal portions and make a ball out of them. Roll out into oval / chapathi shapes. Cut into half and apply water on the straight edge. Now make a cone by joining along the straight edges by overlapping them. Close the cone and seal it properly until you finish making all the samosas. Heat sufficient oil in a pan / Kadai and fry samosas till golden crisp. Drain onto an absorbent paper and serve hot with mint chutney or ketchup.